At Bookseed Studio, Jan Godown Annino welcomes everyone to Poetry Friday. She's sharing a celebration of Dr. Martin Luther King, whose birthday will be celebrated this coming Monday. Thanks for hosting, Jan! Your face holds no expression. You stare out, blank eyes. You allow us to see nothing. I read the book to my granddaughters this week. They are Ingrid, eight and Imogene, six. Imogene is perhaps too young for all the poems but when we came to the poems about hair, her response was that everyone should know not to touch anyone without permission, and Ingrid, with hair like Irene, “long and straight--/a curtain I can hide/behind “ laughed and said, “that’s true, I can.” Charles’ words showed how angry he felt when someone patted his head, said “It feels like a sponge.” Then, Charles patted that person’s head, said back, “Your hair feels like a mop.” The girls laughed, said, "That’s good, he took up for himself. He didn't stay quiet.” Some might say this book is only for older kids, wa-ay older, yet the girls took what connected to them at this time, and will understand and think about more as they re-read it. I don’t want to dwell on two young girls’ responses but will say they enjoyed the book and commented on most of one theme of the story, that people, kids just like in their classrooms, are different, and it’s good to get to know them because they might become good friends. Friendship is important to kids as they navigate growing up, and the more experiences they have with people, the more they will feel good about who they are, and that it’s okay for them to have different looks, different favorites, experiences, and families. I smiled when I read the poems about shoes. That topic is one that students love. This time, Charles and Irene discover some common ground; both have wishes for shoes that aren’t granted. Irene tells: “Mama says/shoes should be/sensible--“ Charles also shows disappointment: “Dad hands me a pair of low tops,/no cool design, no bright color or dynamite laces.” As these two partners travel through their lives, we read of things that are the same and things different, yet the feelings are deep-down the same. No matter who they are, the feelings about race emerge, and that will spark good talk, for older kids, maybe research. Charles gets picked first in basketball, but when he sails the ball over the backboard, he gets picked last after that. Irene burst out at Charles that “sometimes I just need/a break from people.” but goes on to talk about the sweetness of her horseback riding. We readers, like Charles and Irene, are getting to know these kids’ deeper feelings in a wonderfully poetic way. There are things they think, hope, dream, and question. The poems deepen in topic, bringing up mistakes and apologies, hard things like the N bomb and thoughts about police, the good and the bad. It’s a story in verse, brief poems of how things are with two kids. They come together at the end, lining up to meet the author Nikki Grimes, both fans, celebrating the good fortune to meet their favorite writer. The poems face each other on the pages and Sean Qualls and Selina Alko create the pages with pictures of Irene and Charles, showing emotions on their faces as well as important parts of the topic. The collages are mixed up in varying colors and feel just right for each double page. Joyful hearts and shadows, loneliness and satisfaction lie in the words and the pictures. Thanks to Charles Waters and Irene Latham for a book of hope to learn to become less divided, now especially as we will hear words of Dr. Martin Luther King this coming Monday. I just finished Citizen by Claudia Rankine for my book group. Perhaps Irene and Charles' book is a book of learning for children, as Rankine's book is for adults? Hooray! You've had a chance to read this book. Isn't it wonderful? I predict awards for this. I am grateful for you sharing it with your colleagues and your grandgirls. The message and the process of arriving at the message are so needed today! Great post, today! Thanks, Linda, and yes, the book is wonderful. Wish I could purchase one for many classrooms! Looking forward to reading this book...I've seen bits & pieces, so thanks for sharing more about it! Thanks, Matt. I bet you'll love the book! It's terrific! The book went on the library order list. :) Thank you. I'm really looking forward to this one arriving at my library, it just sounds so needed and powerful. I am looking forward to reading this book, but until I get a copy, I am enjoying the heartfelt reviews. I especially enjoyed reading about the reactions your granddaughters had to the story. Hi Linda, I am so heartened at the thought of you reading to your grandchildren - while there are so many students out there who will definitely miss out on your sharp insight and your keen attention to wonderful books that will resonate with them - I believe that what you are doing right here right now is also of equal significance. I hope to find this book soon! I wanted to include it in my SEL bookshelf, but then I realized that it was a novel-in-verse and not a picturebook. Perhaps in my SEL Bookshelf for Older Readers (when I get to that in my lifetime), this would definitely be on the top of the list. Thanks for your well rounded review of Irene and Charles's book, they seem to have packed a lot into a short amount of space, I'm looking forward to reading it! And what a fun and unifying ending meeting Nikki Grimes. I also like the idea of your granddaughters growing into this book, they definitely will pick up more as they continue to return to it–though it sounds like they've already connected with things there, thanks Linda! The more I read this book the more I can't wait to read it! Thanks for the review. I love that you read this with your grands and let them take what they could from it. You never know what seeds you planted. Thanks to everyone for coming by. I am happy to share Charles and Irene's book, hope to give a copy to my bookstore so a customer can discover it, and spread the word about it in another way! The buzz about this book is all good (and why not; anything Irene writes is fabulous and what I've seen of Charles' is too). Someone said "awards"? I hope so. In the meantime, I'm making a note to check and see if my local library (in Canada) has it. Hi Linda! The student poem you shared is touching -- I'm sure you do miss the opportunity to share books like Irene and Charles' with students, although you are making the most of it with your grands! I had to smile at the "need a break from people" line -- I'm sure there are a lot of people (of all ages) who can relate to that sometimes! Thanks, Ruth, Violet, Tabatha & Bridget. I appreciate your comments and hope you enjoy and share this book when you read it. Love hearing the responses of your younger grandchildren--I had thought initially that I wouldn't be able to share in 2nd, but I think I have no choice--the conversation is too critically important. Thanks, Linda! Thanks, Heidi. It's not on our list because it just came out January 1st, FYI! 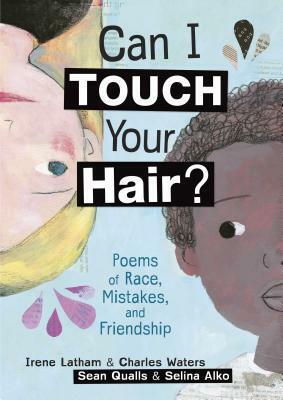 Yes, I think the book can be used for your 2nd graders, some poems are better for them than others, as you will discover. This book is in my library bag. Can't wait to crack it open. Great review. I loved seeing this through the eyes of your grand girls! It is wonderful to learn some of your grand-daughter's thoughts when you read this to them, Linda. Appreciations for sharing. And also thanks for the mention about CITIZEN, which I've added to my list. I haven't read CAN I TOUCH... yet, but this makes me more interested than ever. Thank you, Jan. I hope both become important books in your life. Enjoy!